Strange scenario, yes, but that’s what it can feel like sorting through the large heap of marketing tactics that big-time companies are using, and figuring out which ones will work for your business—without gobbling a large chunk of your revenue. What marketing tactics should you focus on? Which one will cost the least but move the needle the most for your business? Do you even need to spend a lot of money on digital marketing? Do you need to spend any money at all? One way to assess which direction to go with your marketing is to take a look at your competitors and the top marketing spenders in your industry. What are CMOs of top companies throwing their marketing budgets at? Marketing executives are not going to spend big marketing bucks on tactics that don’t work (who would, right?). For CMOs, marketing is such an integral endeavor that one in every nine budget dollars and approximately 11% of company-wide budgets goes to marketing. In addition, marketing budgets at B2C companies are even higher at 16.1% of their company-wide budgets. This coming year should also see double-digit increases with a 15.1% lift in digital marketing spending. There are three main areas CMOs spend these marketing dollars on: Mobile, Social and Analytics. These three are the holy grail of marketing. 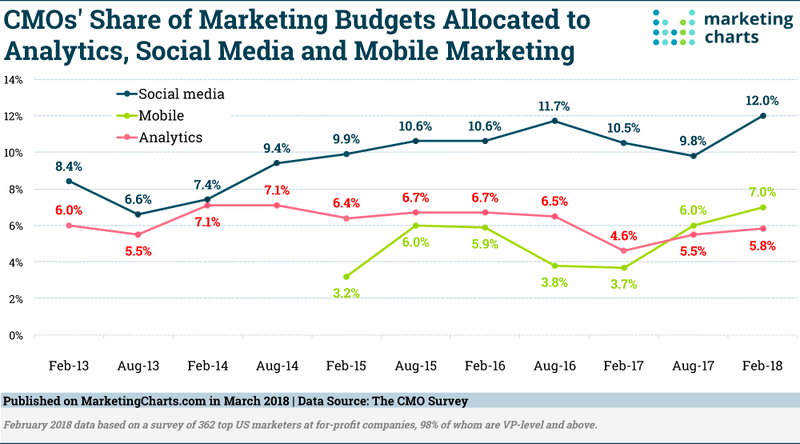 CMOs spend 7% of their marketing budget on mobile tactics, which is twice what they were spending three years ago (3.2%). Social media spending is at 12% with an expected increase of 25% in the next 12 months and a 70% increase in the next five years. CMOs spend 5.8% of their marketing budget on analytics with that number expected to triple in the next three years. The bottom line is that digital marketing is a vital plan for businesses that want to get access to the masses and market to prospects where they hang out—online. Let’s take a closer look at these digital tactics and why they are so popular. Businesses that market online focus on targeting prospects where they congregate to get their attention and begin the process of brand/consumer engagement. And since the number of worldwide social media users is expected to reach 3.02 billion monthly active users by 2021 (this is close to one-third of Earth’s entire population), you can’t blame them for wanting to leverage social media sites. You’ve likely heard marketing gurus tell you that you need to be on every social platform and get as much content out there as possible or else you are missing out. But, we don’t recommend you do this. Please don’t. Why get mediocre results on every platform when you could dominate two or three? If you focus more of your efforts on the platform on which your audience is hanging out, you will get more results in less time and spend fewer resources. So, let’s talk about how to choose the right platform for your business. We like to use two criteria: Demographics and Platform Features/Business Goals. Go where your audience is. 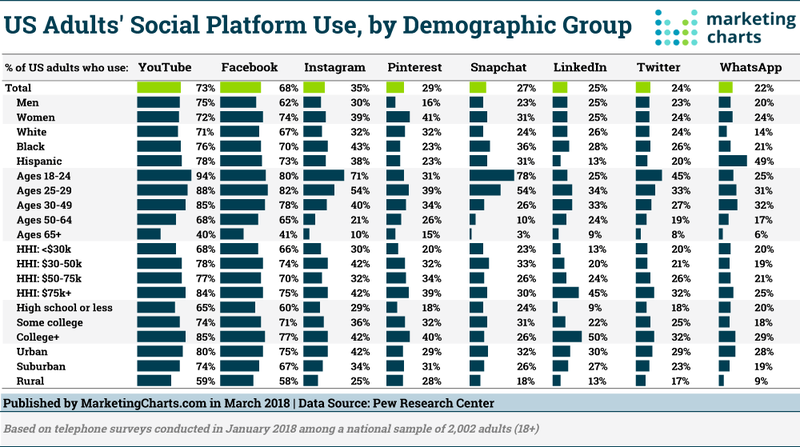 Here’s a chart that shows the demographics of the people on each social platform. Match your audience demographic to find out where they are hanging out. Simply matching audience demographic to the platform is not enough, however. One other way to determine which social platform is right for your business is to match the nature of each platform with your business goals. Instagram is a highly visual network that features professional, eye-catching imagery. If your brand can post beautiful images that capture attention, Instagram may be a wise choice. This goes for e-commerce, retail or any business that makes use of beautiful images in their marketing. Beware: You can’t post stock photos on Instagram and expect to get results. The more creative and professional, the better. Instagrammers love professional-quality images that tell a story. Instagram typically attracts B2C businesses, but there are some B2B businesses who do well on Instagram too. Here’s a handy resource on how to build a following on Instagram. Facebook is another platform that bodes well for B2C businesses. Facebook’s demographic is wider than Instagram, however, and it allows more flexibility in interaction and engagement. Should you use Facebook? Aside from the engagement possibilities, Google considers Facebook a local SEO signal, it and uses your Facebook page to display local search results. For this reason alone, we recommend using Facebook if you run a physical store. If you need some assistance getting an ROI with your Facebook marketing, learn how to increase engagement on Facebook here. Marketers also use Facebook ad retargeting to capture prospects’ attention with relevant ads. Click below to read our five-part series to learn how Facebook retargeting can help you increase sales and conversions. Part 1: What Is Retargeting and How Can It Help Your Business Increase Sales and Conversions? Both B2C and B2B businesses use Twitter for marketing. Twitter has gone through some transitions. It was waning in popularity until the 2016 election, when it reemerged as a popular outlet for news and current events. If you have valuable content to share and your audience is on the platform, Twitter is the way to go. If you want to learn more about Twitter, here’s a complete guide to Twitter marketing. LinkedIn caters to B2B businesses and networking professionals. If you run a B2B business, LinkedIn is the platform to use. Ninety-four percent of B2B marketers use LinkedIn to publish content, and 80% of B2B leads hail from the platform as well. LinkedIn is the most popular professional network. If you are a B2B business, we recommend getting on this platform. Here’s some helpful information on how to use LinkedIn as an entrepreneur and how to use LinkedIn groups for your business. People search on mobile…a LOT. Mobile users consume 2.5 times more minutes per month than desktop users. And though desktop usage still surpasses mobile usage in the US, according to Marketing Charts, website usage has recently stalled. 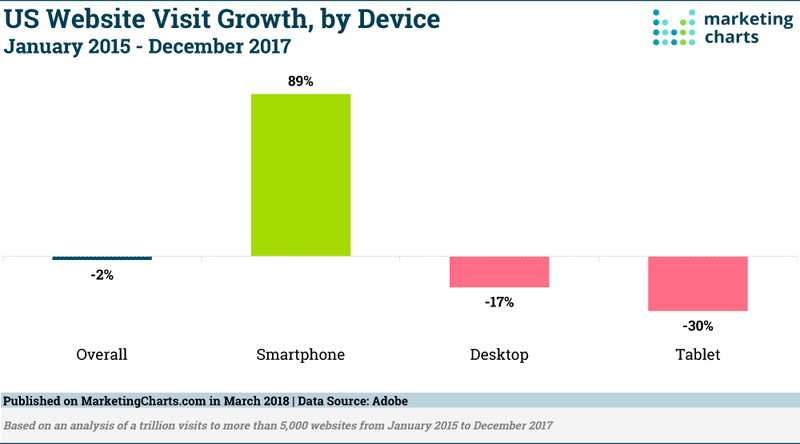 Website visits dropped by 2% between January 2015 – December 2017 and this trend will likely continue. Did you also know that Google loves mobile? So much so that the search engine giant won’t rank your pages in mobile search if you are not optimized for mobile. This means you will miss out on the Google search queries that come from mobile devices (by the way, this is half of ALL queries). How can you stay ahead of the game? Optimize your website for the mobile audience and give mobile users a better experience. How do you optimize for mobile and offer your website visitors a better experience? Your mobile users are only concerned with speed and convenience, period. The faster they can get their questions answered, the better their experience. The better their experience, the happier they are. The happier they are, the more they will engage with you. Speed, speed and more speed – Mobile is a speed game. The faster your load times, the better. Google loves speed too, which is why it created AMP (accelerated mobile pages). Here is more info on AMP. Optimize images, reduce redirects and minimize bloated code. If you do not understand how to do this, consult with an expert for assistance. It’s that important. Streamlined design – Your mobile site should be simple and easy to navigate. Don’t clutter it up with unnecessary images and bloated content. Avoid pop-ups and flash and keep your content separated enough so that text and links do not overlap. Here’s some more information on why mobile design is so important. Short and concise – Mobile screens are smaller, which means you have less room to work with. Keep your URLs, titles and meta descriptions short and concise to encourage more clicks in the search engine results pages. Local optimization – Local optimization is vital if you run a store in a physical location. Potential customers will use their mobile phones to search your website while they are “on the go.” If you want to drive more foot traffic, add your city and state to headings, URLs, content, title tags, alt tags and meta descriptions. 3. 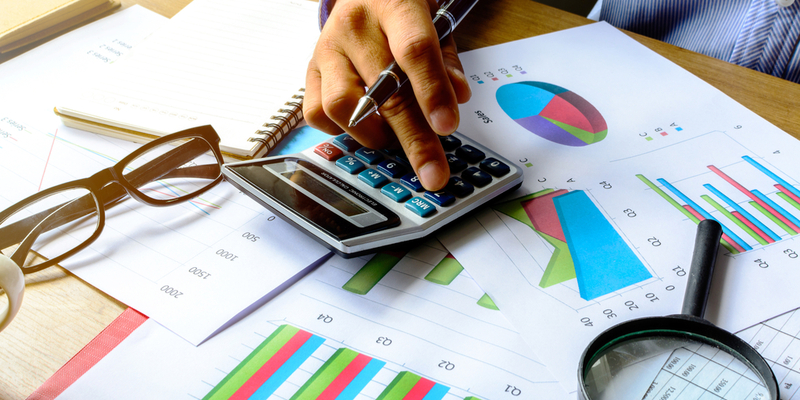 Don’t Waste Time and Money…Leverage Your Analytics! 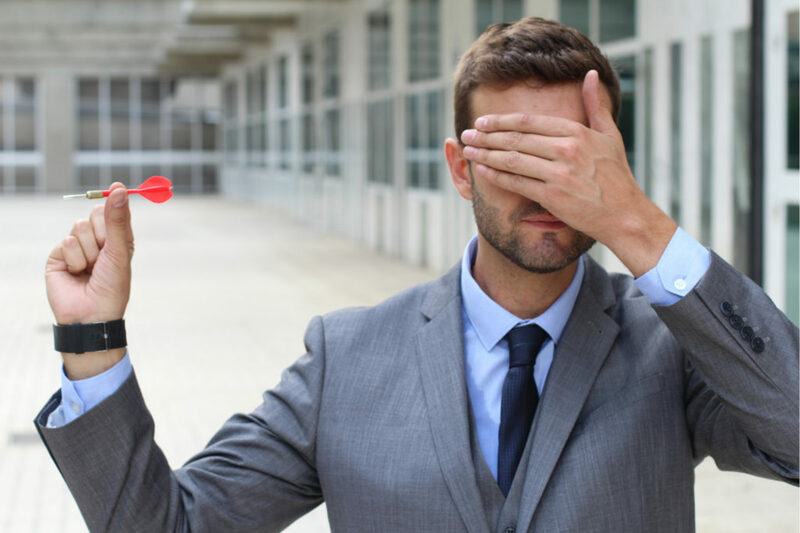 Marketing without analytics is like playing a high-stakes game of darts blindfolded and then walking away without looking at the board to see what happened. Analytics is the glue that holds all of your marketing tactics together. It informs your marketing decisions and, in simple terms, tells you what works and what doesn’t. Why market if you don’t know how your tactics are performing? CMOs understand the power of analytics. As mentioned before, they spend 5.8% of their marketing budget on analytics and that number is expected to triple in the next three years. Analytics is a broad subject so we won’t be able to provide a lot of detail here. But, the point is to monitor the results of every marketing plan you implement. Whether it’s social media posts, blog content, calls to action on your website or autoresponder emails, you should know what your prospects respond to and how they behave online. What analytics metrics should you be tracking? Here’s a good place to start. Analytics also wields another power in that it allows marketers to gather data to inform future marketing campaigns. What if you found out that 30% of your customers preferred one type of lead capture form over another? And you also found out that this segment prefers a specific email or product ad. Win-win, but you need analytics data to uncover this. Data is an extensive subject, but to help you sort through the information, we created a four-part series on data-driven marketing. In it, we show you how to leverage data to increase awareness and sales, and promote better customer experiences. Sure, your business may not be as big as Amazon, but large corporations didn’t get huge by wishing and hoping for sales. Digital marketing is an integral part of their marketing framework. For CMOs, digital marketing is not a choice—it’s a necessity. If you want to access 90% of the US adult population already using the internet and get relevant enough to target today’s modern consumer, follow in the footsteps of those who have done it before and succeeded. Start marketing online. You don’t need a big budget either. Start small. You just need to know which tactics will provide the greatest ROI and then invest money back into the high-performers. What’s next? If you are wondering where to start, leverage the three digital marketing tactics we discussed here (social, mobile and analytics). If you need some help getting started or scaling your current digital marketing tactics, we would be happy to assist. We like to make digital marketing simple :).